In a report published by PTA, on SMS traffic trends in local and global markets, says that a total of 151.6385 billion text messages were exchanged by Pakistani cellular subscribers in fiscal year 2009-10, generating a revenue of Rs. 40.76 billion. This figure translates into 1532 SMS per subscriber in an year or 128 SMS per subscriber in one month. Average price of one SMS is said to be at 27 paisas. Report says that four billion mobile subscribers use SMS service around the world, who sent five trillion messages in 2009 i.e. approximately 105 sms per person per month. Pakistan is ranked Number four for average number of SMS sent per subscriber in a month. According to ITU, SMS traffic is generating an estimated revenue of USD 812,000 every minute (or around USD 14,000 every second) for the cellular companies from 5.3Billion users. 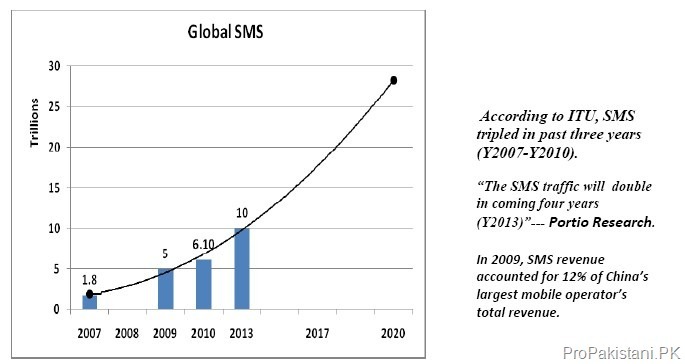 In 2009, SMS revenue accounted for 12% of China’s largest mobile operator’s total revenue. The Philippines and the United States combined accounted for 35% of all SMS sent in 2009. Report says that SMS traffic in Pakistan was exchanged at an average rate of 27 Paisa (Rs. 027) per SMS in the year 2009. Report said that 80 percent of SMS traffic utilized SMS bundles offered by cellular companies, while rest of 20 percent SMS were sent using flat rate of Rs.1/sms. An average bundled package of 700-SMS/ Month is approximately for Rs. 60. According to these two rates, the revenue for SMS-traffic is calculated to be approximately 40.76 Billion. Zong and Mobilink has more outgoing traffic than the incoming traffic. 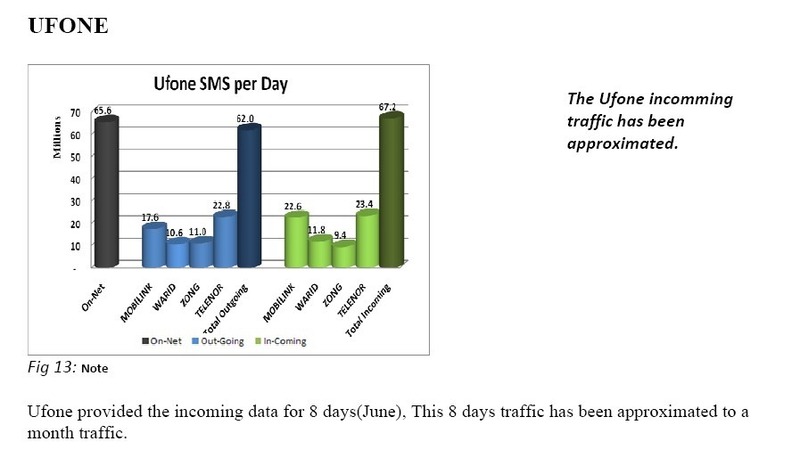 Ufone has the highest SMS traffic on the network. The out and incoming traffic of Mobilink is almost balanced in each month respectively. Telenor has quite high incoming than its outgoing. Following is the dissection of the traffic of all the operators network. 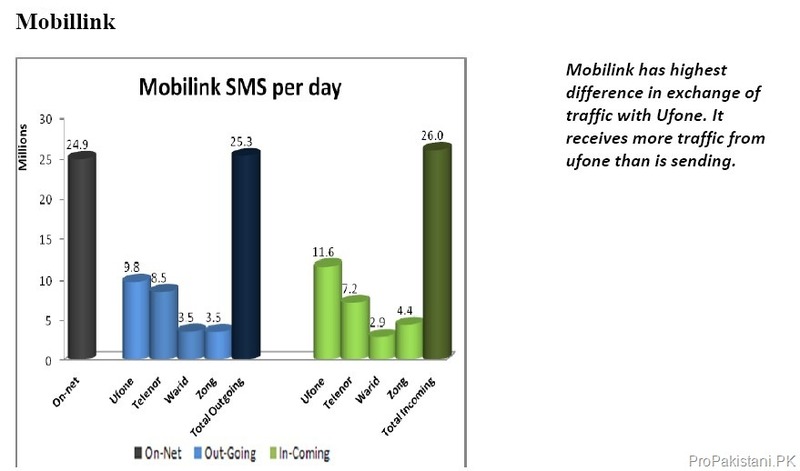 According to Mobilink, it has highest difference in exchange of traffic with Ufone. Incoming traffic from Ufone is more than the sent traffic. 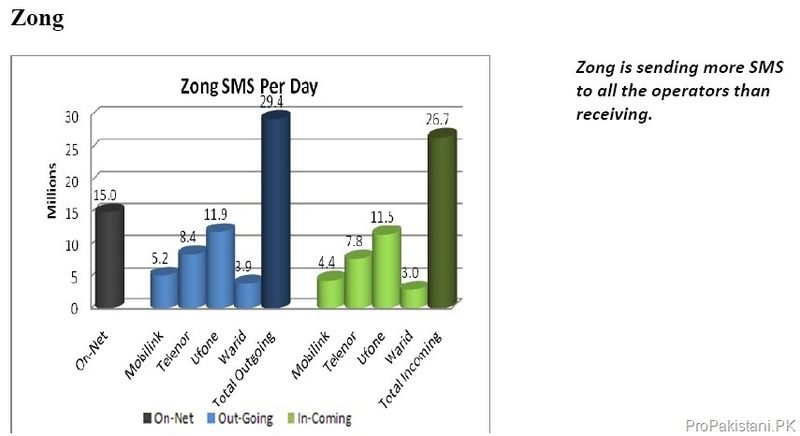 Similarly its receiving more SMS messages from Zong than the sent messages. Where as its sending more messages to Telenor and Warid. 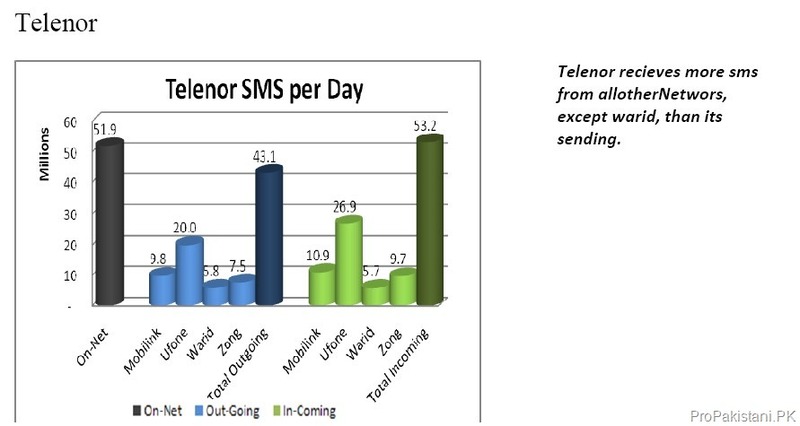 Ufone SMS traffic is the highest landing traffic at the Telenor network. Zong is also sending more traffic to Telenor than is receiving from it. 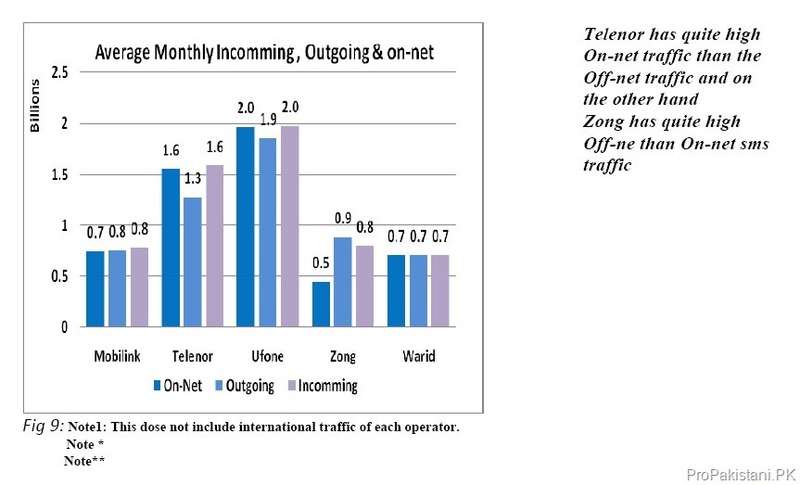 It is interesting to note here that he incoming traffic to telenor from all other networks, except warid, is more than its outgoing to all the networks. Zong is sending more SMS to all the operators than receiving The difference in exchange of traffic is highest with Warid, followed by Mobilink then Telenor and Ufone. Amazing statistics! I am really shocked to see that we Pakistanis spend Rs.40 billion on just messages! Thanks to Pepsi, Zubaida Apa and all these chain messages. One thing to notice here is that per SMS cost in Pakistan is MUCU MUCH lower than other countries and world average. Yeah i noticed that. Infact it’s the lowest among the group of countries mentioned. Most of these txts are just forward txts. Yar we should think how we can dimensionalize this craze for some productive work…..
Govt should impose extra tax on sms. Jahan se hakomat ko income ka chance ha wahan us ko tax lagana chahye rather to make the petroleum prices higher. Infact sms k rates ko bhi international market se jor dena chahye. In this way govt may recover for some how..
hay it’s unbelievable yaar….keep it up Pakistan!!! yaaahooooo!!!! The profits being stolen by these telecom companies is amazing. They should give free SMS, it is a big con to pay for SMS it is all profit for these companies. Wastage of time & Money. Should be converted into sum production. Dear Amir, the SMS Global Trend table has errors in it: e.g. for USA, the cost of 464 SMS at 22 cents per SMS makes over 100 USD. This can’t be (average total ARPU is about 55 USD). Some other numbers are suspicious too. Otherwise congrats on excellent blog!